The first memorial to Special Forces Canine Soldiers was unveiled at the Airborne & Special Operations Museum in Fayetteville on July 27th. The first memorial to Special Operations Forces (SOF) K9 soldiers killed in action was unveiled at the Airborne & Special Operations Museum in downtown Fayetteville on Saturday, July 27. The memorial is a life-sized, bronze statue of a Belgian Malinois dressed in full combat gear. Surrounding the statue are paver stones listing the dogs that were Killed in Action (KIA). "Like their human counterparts, special operations Multi-Purpose Canines (MPC) are specially selected, trained and equipped to serve in roles not expected of the traditional Military Working Dog (MWD)," said Chuck Yerry, President of the SOF K9 Memorial Foundation. "Truly daring and brave, these dogs often lead their soldier team-members in the most dire conditions to save lives and complete the mission." "The SOF K9 memorial foundation saw a need, and what a better place for this memorial than our community of history, heroes and a hometown feeling," said Paul Galloway, Executive Director of the Airborne & Special Operations Museum Foundation. "These K9 soldiers lost their lives in combat. It’s a big deal. They need to be honored." 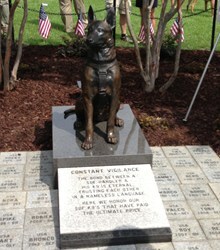 The marker in front of the statue, titled "Constant Vigilance" reads: “The Bond Between a SOF handler and his K9 is eternal. Trusting each other is a nameless language. Here we honor the SOF K9s that have paid the ultimate price." Eagle Scout candidate Harrison Burkart, a Boy Scout from Troop 745, was instrumental in raising funds, designing and installing the landscaping. Located in Historical downtown Fayetteville, the Airborne & Special Operations Museum is part of the U.S. Army Museum System and tells the story of Army airborne and special operations units from 1940 to the present. For more information call 910.643.2778, email info(at)asomf(dot)org, or visit the website at http://www.asomf.org.